American yard Palmer Johnson has teamed up with Latitude Yachts of Latvia to build the first hull in a new series of day boats called PJ63. Measuring 19.4 metres LOA, this carbon-hulled speedster features the classic Palmer Johnson design of a sleek monohull with stabilising sponsons on either side. The yard explains that this design allows for a broad 6.3 metre beam, resulting in the largest open deck in its class, without compromising on performance. 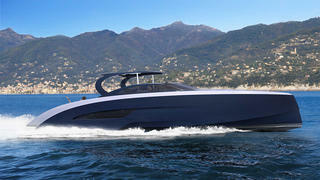 Meanwhile, the fine-entry prow will ensure no slamming or deck spray, even in a head sea. Both open and hardtop versions of the PJ63 will be made available, while the main deck layout includes a pair of sun pads and two large dinettes split by a wide central companionway. Below decks, the PJ63 will feature a lower dinette to port and a galley and day heads to starboard, while accommodation is provided in a full-beam owner’s cabin amidships, a VIP double cabin in the bows and a single crew cabin back aft. 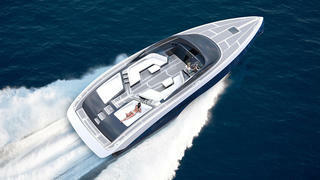 Power will come from a triple Volvo Penta IPS600 pod drive engines, giving the PJ63 a sporty top speed of 36 knots. Palmer Johnson adds that construction of the first hull has begun in Riga, with Latitude Yachts working to CE Category B standards. The final outfitting is due to take place in Italy ahead of a planned June 2017 launch.